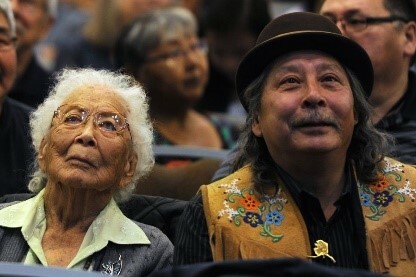 Photo: Poldine Carlo, founding member of the Fairbanks Native Association, with son Glenn in 2015 at the Alaska Federation of Natives Convention (Bill Roth / ADN). Alaska Natives are the indigenous peoples of Alaska. They include: Aleut, Inuit, Tlingit, Haida, Tsimshian, Eyak, and a number of Northern Athabasca cultures. Alaskan natives in Alaska number about 119,241 (as of the 2000 census). There are 229 federally recognized Alaskan villages and five unrecognized Tlingit Alaskan Indian tribes. The largest tribal tradition is Athabaskan. The Alaskan Athabascans are Alaska Native peoples of the Northern Athabaskan-speaking ethnolinguistic group. They are the original inhabitants of the interior of Alaska and neighboring Yukon and Northwest Territories of Canada to the east and are believed to have been one of the original tribes that migrated from Asia via the land bridge. In Alaska, where they are the oldest, there are eleven (or thirteen) groups identified by the languages (or dialect) they speak. Among the research results are findings showing that, when based on genetics and linguistics, the Athabascan peoples are more closely related to the Apache and Navajo tribes of Arizona than they are to other Native American groups in Alaska. Husbands lived with their wife’s family for the first year of marriage, and children were part of the mother’s clan. The Native American – Alaskan Athabascan population data represent DNA samples from 101 Native American (Native Americans in the United States) individuals now settled throughout the interior regions of the state of Alaska, where they once roamed as a variety of nomadic tribes that fell under the umbrella title of Alaskan Athabascan ( Athabascan Cultures). Samples of Alaska’s Native American groups, which make up 19 percent of the state’s population, were obtained by the Federal Bureau of Investigation’s (FBI) Laboratory Division; by the Scientific Crime Detection Laboratory for the Alaska Dept. of Public Safety; and by the Dept. of Environmental Health at the Center for Genome Information, in the University of Cincinnati. Research also was partly supported by grants from the National Institute of Justice, Forensic DNA Laboratory Improvement Program; and from the Bureau of Justice Assistance, State Identification Systems Program.